A month ago at Wednesday Night Fights, a local weekly tournament in southern California, Dawn “Yohosie” Hosie was matched against a player who goes by RazorX. His Adult Gohan lineup was a familiar sight, but Hosie’s lead-off fighter was Gotenks, who used to be one of Dragon Ball FighterZ’s more obscure characters. It’s a fighter that Hosie has touted from day one, and together the two have shot to the forefront of the Dragon Ball scene. Hosie got the first big combo string off, and RazorX was on the ground almost instantly. 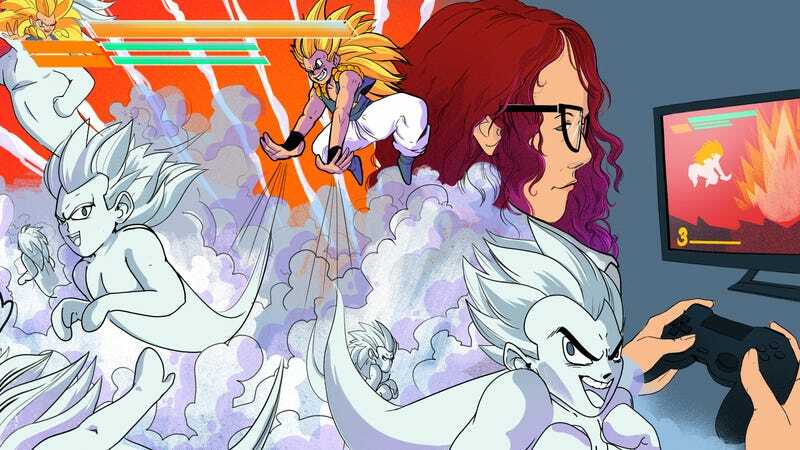 She had built up the first bar of meter, and Hosie immediately spent it to bring out Gotenks’ Super Ghost Kamikaze Attack, blowing explosive ghosts out of her character’s mouth. An average player would release these ghosts in one immediate burst, racking up as much damage as possible. But Hosie had some tech prepared for this moment. Normally, charging up your ki in the middle of a round of Dragon Ball FighterZ is a rookie mistake. It leaves you significantly open to any form of attack. But by holding down certain buttons, Hosie delays the rate at which they fly at her opponent, letting her eke out the pressure in doses rather than one big onslaught. RazorX is a bystander. The commentators lose their minds over what they’re seeing. For Hosie, it was Wednesday; if you’ve seen her Twitter, you know this is just another tool in the bag. Hosie is the self-dubbed “trash mom” of Gotenks, one of the stranger characters in Dragon Ball lore. He’s formed when the young children Goten and Trunks dance and fuse together to make one warrior: Gotenks. The two arrogant kids make one super-brat. Hosie didn’t like Gotenks in the show all that much, as she recalls, but from a gameplay perspective she’s fascinated by him. In a research setting, Gotenks is a blank slate for her innovation. Hosie is many things in the FighterZ community: an innovator, a rising star, its most visible female player, and sometimes the subject of vitriol. She frequently finds herself at home in the lab, poring over frame data and beating up training dummies to discover just what’s possible in this game, and with Gotenks. Gotenks carries a daunting amount of potential for mix-ups and combos, thanks to an arsenal of attacks that can hit from any number of directions. While he’s seen some use from top competitors, he’s nowhere near as ubiquitous as fighters like Cell, Vegeta, or Bardock. While Gotenks can put on the pressure, he’s small and has trouble closing the gap between fighters. His neutral game, or “footsies,” can be lacking compared to more all-around fighters, and his move set isn’t as easy to pick up as more vanilla characters like Goku. A lot of new players were turned off by his complexity, but you can find Yohosie—both her screen name and Twitter handle—online breaking down a different aspect of the game nearly daily. Hosie’s Gotenks is a spinning top of destruction. Getting opened up by him means a whirlwind of spins and short-range jabs are coming your way from strange directions and angles, and then while you’re on the ground trying to stand back up, Hosie is setting up the response. Her other team members—who have oscillated from Goku to Bardock, Kid Buu to Vegeta—pitch in, but the core of the trio is the spinning jerk at the center of it. Gotenks, as he appears in the Dragon Ball Z anime. Hosie is also, right now, the most visible woman in Dragon Ball FighterZ, and she says that while “stream chat will be stream chat,” she’s been broadly accepted. Like many women in competitive gaming, she’s struggled with her own goals and the burden of being a rare representative for women in the fighting game community. Hosie is probably best known for her technical and tactical innovations. Avid players will sometimes share their techniques developed in solo playtime, sometimes referred to as “lab tech,” on social media in order to bolster the community and add to the pool of knowledge. Commentators will frequently mention Yohosie when talking new techniques or concepts: moves like the ghost pressure from above and others, like Gotenks’s signature spinning-top attacks that earned him the “Beyblade” label have all been featured and innovated on in Hosie’s Twitter feed. She had done some tech sharing for Marvel Vs. Capcom 3, but as Hosie put it, she went 1-2. In Dragon Ball FighterZ, she’s found a game that suits both her tech-savvy mind and her gameplay chops. And again, it all comes back to Gotenks. Gotenks has a 236[S] beam special that Hosie calls the “honk honk” where if you hold the beam button, you can hover for a moment and then air-dash, staggering your offense in an unexpected manner. It’s a promising tool for a character filled with mix-up options, but she struggled against local sparring partner 2GBCombo, who responded to it with a “fuzzy” guard, which blocked high and then low for a certain amount of frames, that worked particularly well against it. Hosie says she spends two hours a day in the game’s training mode, give or take an occasional day off. Alongside that, she spends six to eight hours once a week playing with local competitors, where they’ll tally up sets against each other with interspersed workshops. According to Hosie, online play can only get you so far when you’re working with frame delay and lag. For the most optimal training, you need to be physically sitting next to your opponent, and focus on practicing the fundamentals as much as just playing sets against each other. A set from Michigan Masters, where Hosie placed 2nd overall in Dragon Ball FighterZ. For Hosie, the horizon of what’s possible is still expanding. She’s attending Combo Breaker 2018 this weekend, and recently nabbed a spot in the Summit of Power through a fan vote, where she will compete against some of the top players in the game. This was a move that stirred up some of the aforementioned haters; the Summit vote-ins let fans purchase votes to put towards their favored player’s bid for the tournament, and Hosie narrowly edged out fellow player BeyondToxin. The two are friends and she’s “heartbroken” for him, she told me in email, but not enough so to let the trolls win. In the meantime, Hosie intends to prove herself worthy of the spot with actions rather than words. She’s training with fellow competitors like Apologyman and Supernoon over the next month, preparing for both the Summit and Combo Breaker. She tells me that she deals with issues like consistency and nerves. Being a lab technician is one thing, but reliably performing those same perfected plays on stage is a different story. She tells me her aim isn’t to be, as she said, “esports” (with air-quotes). Hosie enjoys her current job and isn’t really interested in the concept of doing nothing but playing a game like FighterZ for a salary. What’s the goal for the Twitter queen of tech, the trash mom of Gotenks, then? It’s impossible to know for sure whether or when that day will come, but Hosie seems unfazed by the road ahead. Gotenks is her new pet project, and what she can already do now might be good enough to carry her to those heights.